This post was sponsored by Divine Flavor, a family-run and grower-owned fruit and vegetable distribution company based out of Arizona. Divine Flavor believes in growing better food for a better world and taking care of both it’s people and the environment. Thanks for supporting the brands that make this blog possible! One of the big mistakes I see in how people approach healthy eating is focusing on restriction when they set goals. I’m going to give up soda. I won’t eat more than two slices of pizza. When I work with clients, I like to focus on adding positive behaviors, not subtracting. Instead of trying to save up sweets for the weekend (and then probably overeating them! ), could you add in a stress-relieving activity after work, rather than immediately going into the kitchen scrounging for cookies? Instead of giving up soda, could you drink more water? Instead of setting a limit for how much pizza you’re allowed to eat, could you slow down and tune into your fullness levels, so you know the point to stop before you’re stuffed? One of the positive behaviors I often work with clients on is packing a lunch more often. While I also highly recommend going out to lunch with coworkers to break up the day, I find having a lunch available most days really makes a difference. When you don’t have anything at the office, it’s so easy to get caught up in the day and work through lunch, or to wait until you’re overly hungry, then eat so much that you’re in a food coma the rest of the afternoon. Neither is the best recipe for a productive work day! I love the idea of meal prep, which works well for some people, but for others (myself included! ), it’s a bit too much. If you travel on the weekends, or just don’t want to devote a Sunday afternoon to the kitchen, trying to prep and cook a whole weeks worth of lunches will be more stress than it’s worth. That’s where I came up with this idea for salad mix prep. Instead of spending hours in the kitchen prepping lunches, spend 10-15 minutes chopping the ingredients to make this crunchy and versatile salad mix, which you can top with leftovers from dinner to stretch into a filling lunch. It’s an easy way to reduce food waste, save time, and eat more vegetables. To make a satisfying lunch salad, be sure to top this salad mix with a.) carbohydrates, b.) protein c.) dressing that has some fat in it and d.) a flavor booster or two. There’s no need to spend tons of time prepping separate ingredients – just use what you’ve got on hand! For carbs, you could use crushed tortilla chips, fruit, or leftover roasted sweet potatoes like I did, or dig into your cabinet and heat up some microwavable brown rice or quinoa. To add protein to my salads, I just used leftovers from my main dishes that week – roasted salmon, grilled chicken, and Indian-spiced lentils. If you don’t have any leftovers on hand, top with nuts and cheese, or quickly cook up some hard boiled eggs. To ensure plenty of options for dressing, I like to have a combination of bottled dressings, plus the ingredients to quickly throw together a vinaigrette. I rarely follow a recipe – just eyeball about half vinegar or citrus juice and half extra-virgin olive oil, and if desired, add some fresh garlic, herbs, a dash of mustard, or spices. Flavor boosters can be anything you have in the fridge – olives, sun-dried tomatoes, cheese, toasted nuts, herbs – basically anything that’ll get you excited about your salad! I like this veggie packed salad mix over regular bagged lettuce because I want a salad with tons of crunch - I find that super satisfying. 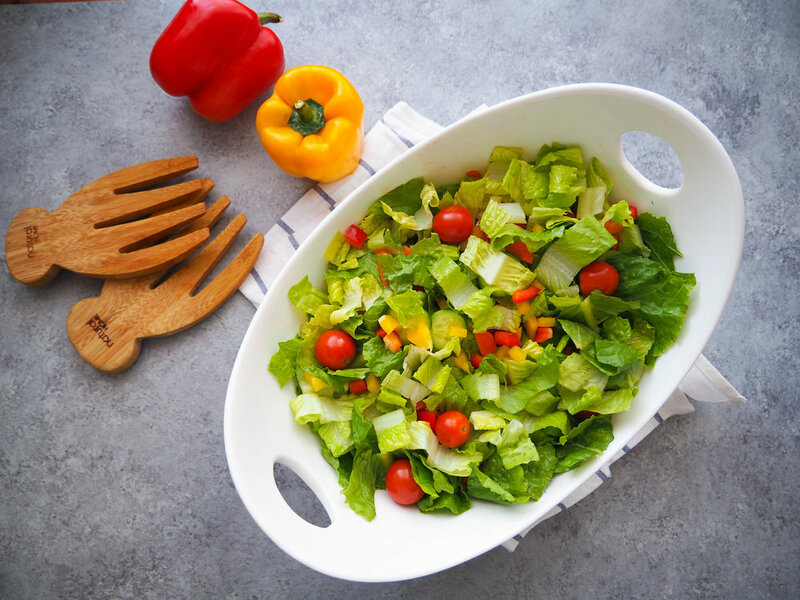 So, I included romaine along with a crunchy mix of produce, like carrots, juicy cherry tomatoes, crisp cucumbers and fresh bell peppers, grown by Divine Flavor, the sponsors of this post. I kept it simple so it was versatile for all types of leftovers, but feel free to use whatever raw vegetables you enjoy. Divine Flavor, a family-run, grower-owned distribution company based out of Arizona, also sells tomatoes, squash, zucchini, and green beans that would be delish in here too. To give examples of how easy this salad mix meal prep is, I gave examples of three “leftover” salads I made with it, all using things I had in my house. First is a harvest inspired salmon salad topped with leftover roasted salmon, apples I had picked up for snacking, toasted pecans from my freezer, and an easy dressing of balsamic and olive oil. You could also used canned wild salmon if you have that on hand, or other seasonal fruits, like stone fruit in the summer, or strawberries in the spring. The second is a tortilla salad made with leftover grilled chicken and crushed tortilla chips I had for snacking on with hummus. I used the rest of my feta cheese I had on hand to give it a bit more flavor. For dressing, I used a bottled cilantro dressing, but you could also add a little chili powder to basic ranch dressing too. The last salad is a curry-spiced lentil and roasted sweet potato salad, made with leftovers from a vegetarian meal. It’s so satisfying with all the fiber in there and I love the sweet and spicy lentils with crunchy fresh vegetables. Basically, consider these recipe suggestions rather than anything hard and fast! Feel free to adapt and get creative with whatever leftovers or things you need to use up. I keep the salad mix stored in an airtight container with a paper towel inside to soak up extra moisture and found it keeps well for 4-5 days. Mix all ingredients together in a large bowl. Pack in a plastic/glass lidded container with a paper towel to sop up any any moisture until ready to eat. 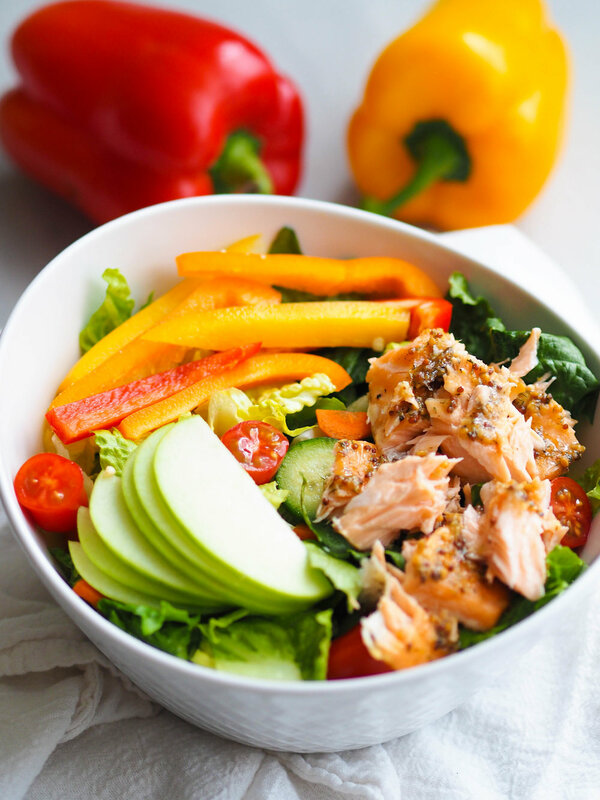 Pack individual serving of crunchy salad mix into an airtight container and top with leftover salmon, sliced apple, and pecans. Mix balsamic and olive oil in a dressing container and pack separately. To prevent the apple from browning, toss with a little lemon juice. Drizzle with balsamic when ready to eat. Preheat oven to 250 degrees. Spray a large baking sheet with olive oil. Top with salmon filets. In a small bowl, whisk together mustard, honey, dill and garlic. Season with salt and black pepper to taste. Spread evenly over the salmon, place in the preheated oven and bake 25 minutes until salmon is cooked through and flakes easily with a fork. Pack an individual portion of crunchy salad mix into an airtight container and top with chicken and cheese. Pack crushed tortilla chips and salad dressing separately to prevent wilting. Toss salad, chips and dressing together when ready to eat. Pack an individual serving of crunchy salad mix in an airtight container. Top with leftover lentils and sweet potatoes. Mix lemon juice, olive oil, honey and mustard in a separate dressing container and season with salt and black pepper to taste. When ready to eat, top salad with dressing and enjoy. Heat olive oil in a large skillet on medium-high eat. Add onion and garlic and sauté until golden, about 7 minutes. Add lentils and curry powder and cook until warmed through, about 2-3 minutes. Season with salt and black pepper to taste. Preheat oven to 400 degrees. Toss sweet potatoes with olive oil. Season with salt and black pepper. Spread evenly on a large baking sheet and roast until golden and tender, about 25-30 minutes, flipping halfway.